Sharing about the importance of being active during this year's PACE Rehab conference. Last week saw the 8th edition of the annual PACE Rehab conference. This year’s topic was „Beyond the Clinic Room – Outcomes in The Real World“. The conference was all about transforming patients’ lives and enabling them to live an active life. Something that has been close to my heart for years, and a theme that has been the leading light for this blog from the very beginning. As it happened the event fell onto the very day that marks the 13th anniversary of my amputation. So it was a nice surprise to learn that a picture of me and my little one was chosen to head the invitations, the poster and program for the day. 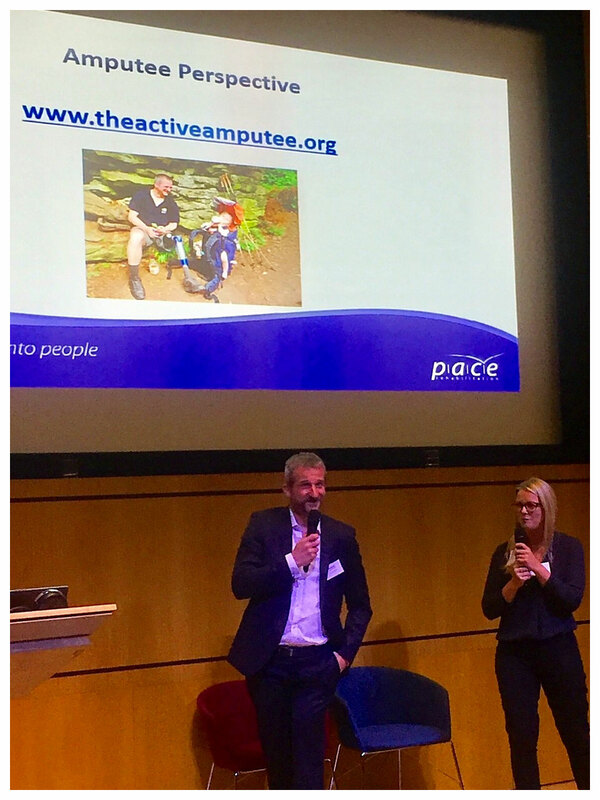 The PACE Rehab conference was again a great opportunity to strengthen existing and forge new relationships with representatives from the industry as well as with other players in the field. It allowed me to get up to speed on some of the new developments in the prosthetic sector and to discuss key aspects of an integrated rehabilitation process that enables people with limb differences to live an active and fulfilling life. Here is a summary of some of the highlights from the conference. With Össur, we have been witnessing some very impressive developments in recent years, especially when it comes to top-end prosthetic feet. The company from Iceland is currently breaking new ground, exploring new approaches by implanting a sensor into the human body to actively control the prosthetic foot. The trials are in their early stages but this surely is something to watch. Otto Bock has been a pioneer for new prosthetic developments for decades. During the conference the German company showed once more that it is one of the industry‘s most innovative players, especially when it comes to upper limbs. Micro processor controlled hands are getting more and more sophisticated, allowing upper limb amputees to improve their quality of life. The Michelangelo hand, for example now features seven different settings ranging from open palm mode to lateral pinch mode, from power grip to tripod pinch. Blatchford led the discussion encouraging us to think in systems, not components, in order to deal with the complex challenges of prosthetic design and usability. With its Linx system, the company developed a micro processor knee and a micro processor foot that communicate with each other, thus closely mimicking the natural movement of a human leg. Focussing on the experiences so far and supporting first impressions through various personal stories, PACE presented it comprehensive rehabilitation approach with an increasingly seamless interaction of and cooperation between the prosthetist, the physiotherapist and the patient. The results are speaking for themselves. The initial rehabilitation process can be enriched and strengthened through peer support activities as offered by a variety of local charities and other non-profit actors. Several of them showcased their work during the conference. With the focus on the limb loss, the developments in the prosthetic sector and the need to take care of the residual limb, we often forget about the immense load that a remaining limb has to deal with after a person goes through an amputation. This is often only an afterthought. And I know from my personal experience that ‘Use it and abuse it’ is often then motto of the day. This often comes at a high price many years down the line. There is now a growing awareness of the associated risks, but more hand-on advice is needed to assist amputees in the prevention of unnecessary wear and tear. An area that surely needs more attention from and education among amputees in the years to come. So much for the highlights. And as I said: I will write more in detail about some of these issues at a later point.